One time I had this dream in which aliens had invaded Earth. They were the aliens from Battlefield Earth to be precise, and they had enslaved most of the people I knew and cared about. To do so, they had hired a few gangs of kids to break into people's houses and convince the owners that they would get better treatment if they surrendered. When three kids entered my house I already knew they were trouble so I took a pool cue from my billiard room and began expertly fending them off. I managed to stuff one into the dryer and turn it on high heat. I impaled another one on the cue. As he watched in horror, I screamed at the other one, "How much did they pay you?" He mumbled, "50 dollars." And as I wound up the cue stick to knock the kid through my window, I yelled, "Is that your price for FREEDOM?" It was a pretty sweet dream. I often like to tell people about it because it affirms the fitness of my mental life. 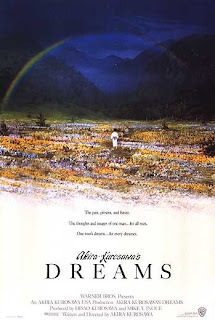 I imagine that this was the initial impulse behind Akira Kurosawa's 1990 film Dreams, which was recently showing at Film Forum as a part of their Kurosawa festival. The film is a series of eight vignettes, all of which the director describes as adaptations of his actual dreams. The vignettes exhibit a wide variety of time periods, plot lines, and storytelling techniques, threaded together by the director's head and not much else. 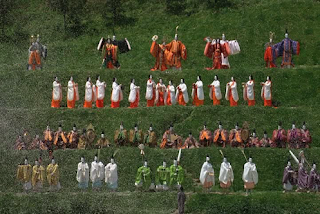 Kurosawa arranged the "dreams" such that broad themes emerge, tying together those stories that are adjacent in a way that mimics the loose boundaries of actual dreams. The first story he tells, "Sunshine Through the Rain," involves an unnamed child who, tempted by his mother's prohibition, goes out into the woods to see the forbidden wedding march of the foxes. These turn out to be supernatural foxes that demand his life in exchange for the transgression of a mortal viewing divine activity. In the story that follows, "The Peach Orchard," a similarly curious little boy makes an appeal to the angry spirits of his family's orchard, asking them to forgive the adults that cut down all the trees. The pace of these two stories resembles that of a fairy tale, and they are lined with the extraordinary tableaus one would expect to find in Kurosawa's head. They also represent the most sensual and fully realized vignettes of the entire film. From then on, Dreams is mostly downhill. Which, I guess you could consider faithful to the mission, if not the ambitions, of the film. After all, for every night I've spent battling the child imps of John Travolta aliens, I've spent several nights taking tests I didn't study for and driving my bike into a wall. The next two vignettes are momentarily interesting ideas that, improbably, have the same runtime as the first two. "The Blizzard" depicts four hikers making a grueling journey back to their camp in the middle of a blizzard. One resolves to press on and is rewarded for his courage by a snow lady that puts a blanket on him to keep him warm. Of course the other guys also survive the night so what the hell did the snow lady accomplish? The idea is painfully similar to "The Woman of the Snow" vignette in Masaki Kobayashi's Kwaidan, only that story had a second, awesome half. Up next is "The Tunnel," wherein a living army captain is literally confronted by the ghosts of the squad he lead to death. Understandably, he is sad about the whole thing and so are they. Then they leave. Oh and there's a big dog that chases the army captain through a tunnel and sounds like a turntable for some reason. OK that was pretty cool. While these two vignettes explore the internal and external trials of man in tandem, they do little to prepare you for the zaniness that follows. "Crows" involves a man in an art museum who apparently looks at a Van Gogh painting so hard he gets trapped inside of it. In the Van Gogh dimension, he hunts for the artist by asking, in French, the subjects of the painting where he might be. 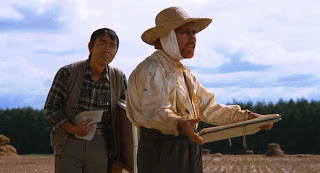 When he finally tracks down the master painter in a field, he is Martin Scorsese. He looks like Van Gogh, but he is actually just Martin Scorsese saying things, in defiant English, about Van Gogh in the first person. Mr. Scorsese scolds and then runs away from the awed protagonist, who then chases the director through...his other paintings. Just watch the video really. There's no way to describe just how bad this looks 20 years after it was made. By Industrial Light and Magic no less! The next and last three films all kind of run together. They beat their collective message into a thick paste and smear it along the surface of the film like vaseline. Act 1: Nuclear reactors are exploding. Mankind is so stupid. 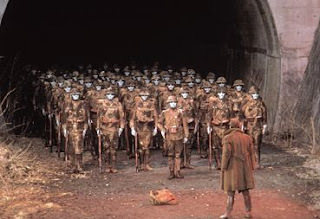 Act 2: Humans are mutating in a nuclear wasteland. Mankind is so stupid. Act 3: An old man shows a wayward tourist how to live without the frills of modern day life, like technology and modern medicine. Mankind is so stupid. The problem with the last of the dreams in Dreams is that they aren't dreams at all. They are too highly moralized to be dreams, too crisply pointed to convince that they were spontaneous in any way. Instead, they are thinly veiled, if beautifully shot, lectures with all the storytelling panache of a Powerpoint presentation. What results is an at times, excruciating vanity project with nothing but its own pretense holding it together. The frustrating thing is that the vignettes that did work are so disparate from the rest of the film that you wish they were considered complete by themselves. It's impossible to overstate Kurosawa's brilliance or the importance of his legacy, but it is not carte blanche for him to let his ideas and clout get the best of him.